Today, the first grade students in Oral Communication class had a speaking test. For the speaking test, they had to memorize and perform a very short dialog from their textbook. They were graded (very lightly) on memorization, pronunciation, intonation, gestures, volume and so on. I'm happy to say the students did quite well. This week, the NELP students have been very busy. In grammar class, the first grade students have been learning about "have" and "like". In oral communication class, they have been learning about American pronunciation, especially Southern pronunciation. As you can see, the students are very motivated. Students raise their hands in class. Students will perform one of the dialogs from the textbook for a speaking test tomorrow. In reading class, students have been studying about Sasaki Sadako and the atomic bombing of Hiroshima. In addition to a story about Sadako in our Visions reading textbook, I also read to students several outside materials, including a rather scary 2002 interview with the pilot of the Enola Gay, Paul Tibbits, an interview with one of the Manhattan Project physicists, Dr. Richard Feynman, and a short essay written by a friend of the family who, as an American sailor during WWII, visited Hiroshima approximately ten days after the bombing. In Friday's reading class, we will talk about the cost of war, and about various peace organizations around the world, and will read several short statements about peace from former president Dwight D. Eisenhower (the Cross of Iron speech), and by Mairead Corrigan and Betty Williams, co-recipients of the 1976 Nobel Peace Prize for their efforts in Northern Ireland. First grade students also turned in their 'secret' notebooks for their Special Projects class. I will check the notebooks and give them to the students' 'secret pen-pals' on Friday. The second grade NELP students are currently studying comparatives, and will have a very tough speaking test on Monday. On Friday, they will have a chance to talk with an exchange student from Finland who will be visiting our class. In our second grade reading class, students have begun to learn more about the parts of a story, including conflict, characters, motivations, and so on. The third grade students today performed a short exercise, carefully disguised as a game, which practiced word-association and words grouped around a theme or topic. The purpose of the exercise was to help students deal with words they don't know in English by having them think of words that the 'unknown word' is associated with. In other news, the third grade students have been given a very interesting and difficult assignment for their next presentation. Each student will make a report about another student in the class (subjects were assigned in class). The student must write fifty things about their subject, but they cannot write what THEY know about the subject: they must interview fifty people to find out what OTHER people say about the subject. I told the students that what they are told, and what they report, need not be true. It only needs to be what people say. The purpose of this exercise is reported speech, using phrases like: "I heard that", "somebody said that", "someone told me that", etc. I'm really looking forward to the reports, which will be given in class on Monday. Today was the first lesson of our first grade special projects class. Today we explored several places on the Internet where students can practice their English, including vocabulary and grammar. 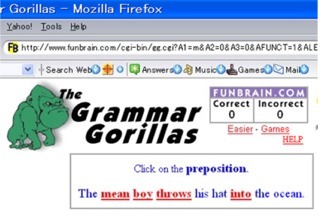 One of those places was the "Grammar Gorillas" site. Also, I gave the students their first homework assignment for the NELP Special Projects class: students were each given a notebook. Earlier this week, students chose 'secret' names. Using these secret names, students will write letters to each other, trying to keep their identities secret for as long as possible. The students seemed very excited to start. The Mid-Term Exams finished early this week, and I am mostly very happy with the results. On the first grade grammar test, one person had a perfect score. On the first grade reading test, four people had perfect scores. On the second grade reading test, the highest score was 58 out of 60, however, I am not surprised that no one had a perfect score on the second grade reading test because the test was quite difficult and the grading standards were stricter than last year's standards. One important point was once again made very obvious from this test: the importance of homework. Those students who did their homework and did their homework on time overall had higher scores than those who did not. Students who either did not do their homework, or whose homework was late and who therefore did not have time to learn from their successes and failures in their homework assignments, generally did poorly on the test. One other very important point that I was glad to see was that students who came after school to study with me not only were better prepared for, and thus had better grades on, their mid-term tests, but also understood the concepts much better and saw a marked improvement in their English ability. I was really very proud of the students who came to study with me after school.